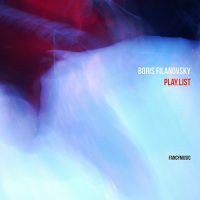 Boris FILANOVSKY: Play.list (2013). Olga Rossini (sop), Sergey Malinin (bar), Moscow Contemporary Music Ensemble, Feodor Lednev (cond.). Fancy Music FANCY031 (1 CD) (http://www.fancymusic.ru/). Not easily classifiable, but assuredly one of the best things I’ve heard this year. In 16 intentionally disjointed tracks, with internal repetitions and drop-kicked transitions, Play.list unspools like a pocket Strauss tone poem tracked randomly. With the two vocalists, the friskiness of Ligeti’s Aventures also comes to mind. The ensemble includes accordion, detuned piano and synthesizer. Everyone has well-placed extended effects (e.g., multiphonics, exaggerated vibrato, squeaks, undefined pitches) to deploy into uncomplicated textures. Movements may share similar designations, as if part of a series: “chord” tracks are brief as if outlining a single collection of notes, “timecode” movements keep somewhat constant meters, the “[endless] melody” series suggest a tune in delicate unison. The movement titles help only up to a point; the ears must find the rest and navigate fragile memory. Maybe Filanovsky has discovered how we experience music with our gadgets and short attention spans, or maybe everything will sound like this in a few years. The Moscow Contemporary Music Ensemble executes with panache. I was reminded of the Ensemble Klang in terms of spirit as well as program. Henryk GÓRECKI: Symphony No. 4, Op. 85, “Tansman Episodes” (2006). London Philharmonic Orchestra, Andrey Boreyko (cond.). Nonesuch 549570-2 (1 CD) (http://www.nonesuch.com/). It wasn’t until 1992, some 16 years after it was written, and after a few recordings, that Górecki’s Third (1976) achieved a surprising pinnacle of popularity. For the most part its composer navigated his unexpected success with indifference. Presumably he enjoyed the royalties. Long anticipated, the Fourth fails miserably at being a docile successor. 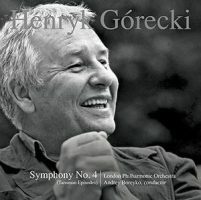 In fact, it was incomplete at Górecki’s death in 2010, and was completed and orchestrated by his son Mikolaj. The allusion to Tansman is a red herring. Alexandre Tansman (1897-1986) was a Polish-born composer who emigrated to France. The symphony’s structure and its tunes are apparently derived from the letters in the Polish rendering of Tansman’s name (A-A-E-E flat-A-D-E-D-C-A-E flat-E-A), clearly audible once indicated. There’s nothing here that we wouldn’t expect from the composer of Lerchenmusik or the Harpsichord Concerto. Let us not forget that this composer also wrote a petite requiem for a polka. Górecki crudely staples together the serious and sarcastic. Movement breaks seem arbitrary, and the most memorable effects involve lurching between introspective harmonies and whining volleys accented with offbeat drums. Imagine Fellini carting away Verdi’s Requiem to the circus. Two clarinets might suggest frosty Sibelian landscapes (they are actually quoting Szymanowski’s Stabat mater) but then are quickly trampled underneath brazen Orffian fanfares. Each movement (there are four) introduces fresh fodder as banal tunes giggle over oompah accompaniments. Late in the game there is a thinly disguised Wagner quote. Repeated listening dulls the conflicts; however, you may soon expect a Theremin as if this were a horror-flick score. Some might think this 35-minute Fourth profound, others will suspect a practical joke. I tend towards the latter, but I don’t mind being tweaked. Górecki is good at this. Perhaps we’ll need another, more sympathetic performance to tease out the sublime. Leonardo BALADA: Symphony No. 6, “Symphony of Sorrows” (2005)1; Concerto for Three Cellos and Orchestra, “A German Concerto” (2006)2; Steel Symphony (1972)3. 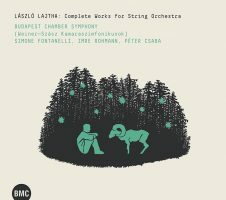 Hans-Jakob Eschenburg2, Michael Sanderling2, Wolfgang Emanuel Schmidt2 (vlc), Galacia Symphony Orchestra1, Berlin Radio Symphony Orchestra2, Barcelona Symphony Orchestra3, Jesús López-Cobos1,3, Eivind Gullberg Jensen2 (cond.). Naxos 8.573298 (1 CD) (http://www.naxos.com/). 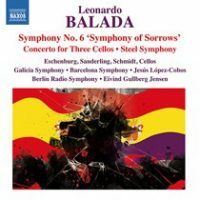 By my informal count, this is Balada’s 16th Naxos release. I’ve tagged along at a respectable distance, but Balada’s current style which blends recognizable melodies with avant-gardisms doesn’t always persuade. At the heart of the Sixth, “dedicated to the innocent victims of the Spanish Civil War,” are the competing sides’ tunes Himno de Riego and Cara al Sol, manipulated to represent war’s senselessness. It’s possible to listen to the 18:46 work as a discourse on developing variation. However, despite intentions, No. 6 fails to deliver emotionally. Leveraging a 1933 song, Die Moorsoldaten, the three-cello concerto turns comical when Balada’s modernist strokes finish abruptly with folksy flourishes. Balada readily acknowledges his “surrealist technical and emotional treatment” but the contrasts fail to convince. Inspired by the industry surrounding Pittsburgh, the Steel Symphony is an example of Balada’s more successful vocabulary. The 1972 Symphony emerges from an orchestra tuning up, and follows with gestures that Varèse could have chiseled out. Absent tunes, the boldly orchestrated abstract gestures convince. László SÁRY: There’s only ever what there is (Mindig csak az van, ami van) (2005)1; In memoriam Igor Stravinsky (1980-2001)2; Journey to Ixtlan (Utazás Ixtlan felé) (1980)3; Hyperion’s Song of Destiny (Hyperion sorsdala) (1985-86)4; El viaje definitive (1992)5; Ludus choralis (2013)6; Hexagramm (1988)7. Klára Csordás3,5 (m-sop), Lajos Lencsés5 (E.h.), Horia Dumitrache5, Lajos Rozmán5 (clar), Anna Mérey6 (vln), István Lukácsházi6 (cbs), BHKZ Academy1,3,4,5,6,7, MR Symphony Orchestra Winds2, Schola Cantorum Budapestiensis1,7, Géza Gémesi1,2,3,4,5,6,7 (cond.). Budapest Music Center Records BMC CD 218 (1 CD) (http://www.bmcrecords.hu/). This Sáry program subsumes you into its vortex, craving more. The simplistic analogy is to combine Arvo Pärt and Aldo Clementi, as Sáry uses complex canons and imitation, except his efforts are darkly hued and downcast. Sáry may start a melody and have it followed in parallel with small rhythmic changes, near enough to cause claustrophobic dissonance. These seven pieces are arranged symmetrically with a glooming 24-part string piece at the center surrounded by instrumental pieces and song settings. There are voices in There’s only ever what there is, Journey to Ixtlan, El viaje definitive and Hexagramm. Journey to Ixtlan and El viaje definitive are two versions of the same setting but El viaje accompanies the vocalist with three instruments instead of 12. In memoriam Igor Stravinsky utilizes the same instrumentation as its honoree’s Symphonies of Wind Instruments. Timbrally, it might suggest Stravinsky, but voices may go their own ways, or combine thickly. Most all these pieces stop abruptly, disconcertingly. 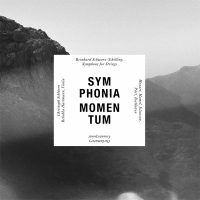 “Symphonia Momentum: Declamatory Counterpoint.” Reinhard SCHWARZ-SCHILLING: Symphony for Strings (1932). Wolfgang Amadeus MOZART: Adagio – Allegro from String Quartet in C major, “Dissonance,” K. 465 (1785). Peter Michael HAMEL: Ulisono for 14 solo strings in memoriam Ulrich Stranz (2010)*. Anders ELIASSON: In medias res (1971)**. Arvo PÄRT: Orient & Occident (2000). Ludwig van BEETHOVEN: Cavatina from String Quartet in B-flat, Op. 135 (1825). Helmut Nicolai* (vla), Rebekka Hartmann** (vln), Symphonia Momentum, Christoph Schlüren (cond.). Aldilà ARCD 004 (1 CD) (http://www.aldilarecords.de/). The grays of the cover and booklet reinforce this somber program. Appropriate liberties are taken with several pieces: We hear Schwarz-Schilling’s string quartet, the first movement of Mozart’s Dissonance and the Cavatina from Beethoven’s Op. 135 bolstered into a 20-person string orchestra including contrabass. Perhaps there should have been more of the Mozart or Beethoven, instead of just singletons. In this premeditated program, the lively Mozart Allegro jars the cosmic plan, especially after the gravity of the Schwarz-Schilling. Hamel’s Ulisono whittles the group down to 14 with a prominent solo viola part. Eliasson’s In medias is for solo violin. Maybe it’s me, but all non-serial 21st-century solo violin music ends up sounding like Ysaÿe’s unwritten Seventh sonata. The program is dedicated to Eliasson who died in 2013. The Schwarz-Schilling Symphony makes a bold statement at the program’s start. Pärt’s Orient & Occident is shorter, a single movement, and comparatively serious. It spins a monody with momentary harmonies, open chords, slides and modes suggesting the orient. Those momentary chords, built around open fifths and using Pärt’s tintinnabuli grammar, suggest the occident. I found myself coming back to the Pärt. László LAJTHA: Symphonie “Les Soli,” Op. 33 (1941)1; Sinfonietta No. 1, Op. 43 (1946)2; Sinfonietta No. 2, Op. 62 (1956)3. Budapest Chamber Symphony, Simone Fontanelli1, Imre Rohmann2, Péter Csaba3 (cond.). Budapest Music Center Records BMC CD 189 (1 CD) (http://www.bmcrecords.hu/). If Bartók had become neo-classical, looking towards his Czech colleague Martinů, then he might have sounded like Lajtha. In Les Soli (for strings with harp and percussion), each movement features a string soloist: contrabass in I, viola in II, cello in III, and violin in IV. The two Sinfoniettas are tripartite, like concertos, and less adventurous than Les Soli. The last movement of No. 1 incorporates playful gestures and feints, dissonance contrasting a peaceful rondo tune. No. 2 is a decade later, similarly neo-classical style, but sometimes given to comic moments, and asking for finesse and delicacy which the Budapest Chamber Symphony delivers genially. The second movement is darker, using styles that flash back to Verklärte Nacht. 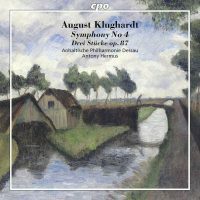 August KLUGHARDT: Symphony No. 4 in C minor, Op. 57 (1890); Drei Stücke, Op. 87 (1901). Anhaltische Philharmonie Dessau, Antony Hermus (cond.). cpo 777 740-2 (1 CD) (http://www.cpo.de/). Klughardt’s Fourth is sturdy and elegant. Across 38 minutes, its four movements do not deviate from standard formulas but teem with delightful ideas and melodies. The compact scherzo provides bright contrast to the somber first movement and tender Andante. Klughardt met Liszt, attended Bayreuth, and conducted Wagner in Dessau, but kept a reasonable distance despite rousing horn calls and modest bombastic touches. Contemporaneous with Brahms and Dvořák, it is possible to glimpse the thick grandeur that would swell in Elgar. The three pieces, Capriccio, Gavotte, Tarantelle, are lighter in concept, but fleshed out in a grand style. The Anhaltische Philharmonie does a fine job celebrating a fellow Dessau musician. 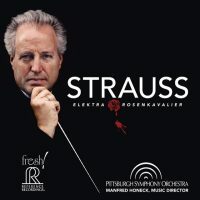 Richard STRAUSS: Elektra: Suite from the Opera (1909; arr. Manfred HONECK and Tomáš ILLE, 2015); Der Rosenkavalier: Suite from the Opera (1910; arr. Artur RODZINSKI, 1944). Pittsburgh Symphony Orchestra, Manfred Honeck (cond.). Reference Recordings FR-722SACD (1 SACD) (http://referencerecordings.com/). Elektra without voices can be exciting. We hear Strauss commanding a large orchestra, and perhaps at his most innovative harmonically. I was surprised from the very outset, as the opening three-note gesture (Agamemnon’s motive) is pitched lower than it appears at the opera’s start. Unlike Der Rosenkavalier, which is closer to a numbers opera and can survive cuts, Elektra is a through-composed thunderbolt. On stage, the opening lurches immediately into a scene with minor characters which doesn’t lend itself to orchestra-only, even though Strauss quickly casts out several recognizable themes which I missed from this suite’s opening. The back part of this Elektra Suite is taken directly from the concluding scenes without omissions. Heard this way, I made connections with Salome that weren’t evident before. The Rosenkavalier Suite is quite a different beast, reeling out favorite and familiar bits from Strauss’ most popular opera. Gregarious and sultry, there’s an opulence with this Strauss not found in the disquieting Elektra Suite.